In a Nutshell: Headquartered near one of America’s most prestigious universities with branches all over Massachusetts, Cambridge Savings Bank continues to build on its more than 180 years of experience in serving customers. A 2016 rebranding brought on a banner year for the company as it rededicated itself to enhancing customer experience. Recent award-winning technological innovations from CSB have made the process of investing and growing your savings easier and more secure. 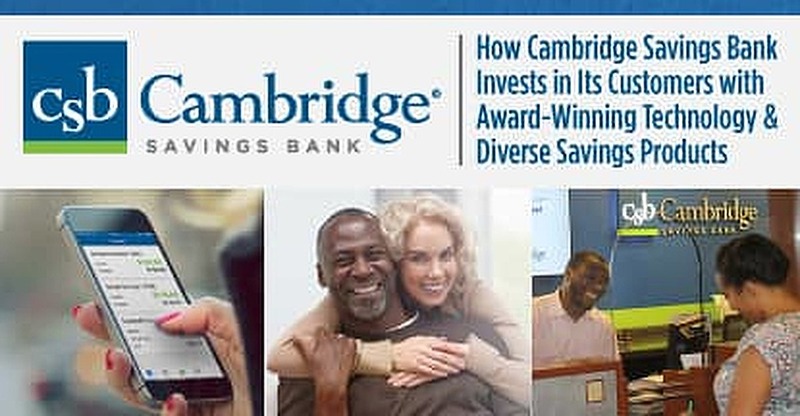 With low minimums to open an account and savings interest rates that climb as high as 1.25%, Cambridge’s offerings fit the financial needs of a broad range of consumers. Ten dollars went a lot farther in 1834 than they do today. Back then, a ten-spot had the buying power of about $275 in today’s market. However, that isn’t to say that $10 can’t yield something good in 2017. In 1834, a business named The Savings Institution opened in Harvard Square in Cambridge, Massachusetts. In 1868, the company changed its name to Cambridge Savings Bank (CSB). To this day, its headquarters remain next to one of America’s most respected universities, with 14 other branches spread across the Massachusetts towns of Arlington, Bedford, Belmont, Cambridge, Burlington, Concord, Lexington, Newton, and Watertown. A Charlestown branch is scheduled to open in 2017. Although times — and banking habits — have changed, one constant at CSB has been a dedication to customer experience. Ten dollars can get you started with a basic savings account at CSB, with higher-tiered accounts available that feature interest rates of up to 1.25%. The company also issues a host of credit cards for varied needs through both Visa® and American Express®, including a card with 0% APR for 12 months, and a rewards card that offers up to 3% cash back. CSB’s customer-centric approach to banking, which includes charitable and educational programs for customers at every stage of financial wellness, extends to all of the communities it serves. While educating clients is a goal, CSB also places a high priority on technological innovation. A 2016 redesign of its website that included award-winning add-ons to make investing and banking easier and more secure helped to usher in a remarkable year for the bank. Despite its storied history, CSB continues to improve year over year. In 2016, total assets topped $3.4 billion, an increase of 7% over the previous year. Total deposits were up by 11% to $2.6 billion and total loans grew by 10%, to $2.7 billion. Perhaps most impressive was the $22.2 million net income, a 24.3% improvement from 2015. The banner year coincided with the bank’s rebranding under a new slogan, “Always You,” a nod to its focus on customer service and individualized service. As part of the initiative, the bank also took a closer look at which tools customers were asking for. That strategy led to the introduction of Connect Invest, an online product that allows customers to merge multiple investment portfolios onto one platform, view all of their balances and performances at once, and get advice from an automated or live advisor through the company. Connect Invest monitors all of your accounts and helps optimize your strategies to maximize returns. The program is one of the first among US banks to integrate online banking and add a digital investment platform. To bring it to life, CSB partnered with San Francisco-based SigFig, which signed a development deal with Wells Fargo for a similar product to launch in 2017. CSB’s drive to be the first to innovate new spaces in the banking sector earned it recognition for its top FinTech offering. Technology plays a significant role in CSB’s push into the latest generation of banking. Members are offered robust online account access, along with same-day service for new account holders or existing members who want to upgrade their debit card to a chip-enabled EMV card. Connect Invest gives users a unified view of their accounts with analysis and recommendations. Online and mobile banking has all the bells and whistles customers have come to expect from a tech-centric financial institution. Person-to-person (P2P) transfers and bill pay are included, as is the ability to use Apple, Samsung, and Android payment apps from your phone or other enabled devices. CSB’s business arm, which includes Corporate Banking and Commercial Real Estate, extended more than $860 million in new loan commitments last year. As the company pushes into the commercial and SMB sector, its real estate loan portfolio reached $1.7 billion and total commercial loans and industrial revenue bonds hover near $300 million. Many financial institutions host educational lessons online. These resources typically allow customers to watch short videos or tutorials on how to improve their finances by taking alternative approaches. CSB takes this strategy to a new level by bringing the classroom offline and into the community with a series of free courses that are open to the public. Last year, CSB hosted live seminars on ID theft, home buying, running a small business, and dozens of other topics. In all, the company conducted 217 courses, in which 50 employees volunteered their time to educate 3,355 participants. CSB also conducts Teach Children to Save educational lessons at local elementary and high schools to instill good financial habits in youngsters and motivate them to start saving early. Each year, CSB and its employees contribute around $1 million and more than 2,500 volunteer hours to more than 400 organizations in the areas of health and human services, housing and community development, and education. The bank provided $32 million in financing last year to supply housing for low-income families and create jobs within the communities it serves. Few US-based financial institutions can match CSB’s experience. Since 1834, the company has seen depressions, recessions, and countless graduating classes pass through Harvard Square. Growing from a single brick-and-mortar location to 15 branches, with accessibility extending to any computer or mobile device, CSB has evolved to become an experienced institution that’s ahead of its time. With online programs like Connect Invest, CSB customers are able to improve investment strategies with the help of human and robo-advisors that take into account each customer’s individual holdings, risk tolerance, and needs to improve their chances at success. The company’s checking and savings products are tailored to help all types of customers improve their financial well-being. CSB also takes stock of its surrounding communities, including its commitment to the renewable energy industry. To date, more than $115 million has been donated to sustainable solar energy projects throughout Massachusetts and New England. Above all, the company takes its motto, “Always You,” and uses it as an invitation for current and potential clients to experience a personalized level of customer service.